This past weekend was a Godsend. I've been horribly stressed at work as of late. Well, stressed isn't the best word for it but busy definitely is. I don't get too stressed by I get tired of being so darned busy. Anyway, despite my inclination to finish things up at work before quarter end I decided to capitalize on Flor's Spring Break and take a couple vacation days to be with her when she's got nothing on her plate. 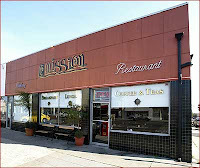 Saturday we got up around noon and met AJ Buerer for lunch/breakfast at the Mission Cafe in North Park. It is always nice to see AJ and it's even better to see him doing so well now that he's back in San Diego. Anyway, during normal conversation we started talking about the Zoo and the animals and then because of my awesome purchase last month of annual zoo memberships for the two of us, Flor and I decided to make an impromptu trip to the zoo to see the big cats. Unfortunately AJ opted out of coming but next time he will have to join us. Had we remembered we could have gotten him in for free with our guest passes. Ohh well. Anyway, Saturday was just the beginning. Sunday Flor and I headed down to Chula Vista for another attempt on the monthly PBA Tough Shot 5-Gamer Tournaments. This ended up being a bust as the approaches were sticky and I couldn't keep my footing. It was so bad that I just lightly threw the ball one-handed like everybody else with out sliding on the approach at all. This of course did not allow me a chance to score well but guaranteed me that I would not injure myself. Despite my "I-Give-Up Performance" I still managed to beat out a couple people sliding in at a cool -202 for 5 games. Blah! Complete results can be found here. All of my other bowling stats can be found here. I think that I'm going to stop bowling these events. I just don't like the approaches. I know I've bowled well there before but I've never liked the approaches and Sunday they were as bad as I've ever seen. Anyway, that's just the beginning of the weekend. The second part I'll have to blog about a little later. Flor and I decided to take our vacation together up to Big Bear Lake and Snow Summit. I've got photo and video and a lot to say about our time there... but not until later.